SOUTHAMPTON, NY – In a partnership with the Shinnecock Nation, fans on hand for the 118th United States Open Championship at Shinnecock Hills Golf Club (Southampton, New York) will have the chance to view the vibrant golf artwork of Lucy and Jace McTier (McTier Art). McTier Art will be showcasing its popular golf paintings through the NextLinks booth located a short walk from the U.S. Open Championship’s Train Station and the championship’s Gate 2. They will also unveil two new golf paintings this week in their collection during the U.S. Open Championship. The Shinnecock Indian Nation worked closely with the United States Golf Association (USGA) to develop and provide the space that will be showcasing the McTier Artwork around the NextLinks interactive attraction. The Shinnecock Nation has been part of the fabric at Shinnecock Hills since before 1896, when the second U.S. Open was played. The land was once owned by the Shinnecock Nation and the course was built by members of the Shinnecock Tribe. Since then the Shinnecock have been part of the club working as caddies and on the grounds crew. During past U.S. Open’s, the Shinnecock and USGA have worked together in a variety of ways to help the Shinnecock and this year is no different. World renown sports artist, Jace McTier and portraitist, Lucy McTier, have been preserving and promoting the history and future of golf through their unique and beautiful paintings of the games greatest players including Arnold Palmer, Jack Nicklaus, and Lee Trevino to name a few. Their works of art will also include a depiction of the first round of golf played in America in Yonkers, NY, as well as the legendary Robert Tyre Jones Jr.’s first major win in the 1923 U.S. Open at Inwood Country Club in Inwood, NY. The McTier artists have painted for presidents and sports superstars from around the globe for nearly half a century. A portraitist since 1979, Lucy McTier’s work became nationally recognized when she had the opportunity to paint President Ronald Reagan in 1985 and present him with the portrait in the Oval office in the White House with her then five-year old son Jace, and husband David in 1985. Lucy’s work is hanging in over 350 public and private collections, and in several gallery locations around the world. Her work is primarily in oil on linen, but she offers prints of her work as well. Her work includes wildlife, children’s illustrations, abstracts, realism large landscape/figurative works, religious and commissioned portraits. Today, her son Jace David McTier is her colleague and partner continuing the family legacy of artwork. His first sporting painting was commission before the 1996 Equestrian Olympic trials when he was just 16 years old. In 2009, he teamed up with Angelo Dundee to recreate the history of boxing through the great trainer’s eyes. This included the “Phantom Punch” (or “Anchor Punch” that lifted Sonny Liston off the canvas and propelled Ali on his path to greatness), which has been displayed all over the world. McTier’s work has been compared to LeRoy Neiman by a variety publications and collectors. 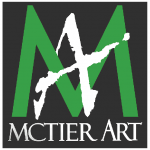 For more information visit www.McTierArt.com and follow them on social media @McTierArt.